The blurb claims this book to be a “Silent Spring” for the literary mind. That is certainly comparing apples to oranges, but at the core to this book there is a thought-provoking argument about the impact of various technologies on the workings of the mind. 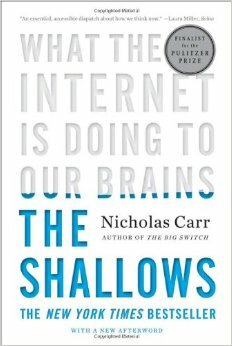 Carr’s main thesis (to be found almost in its entirety in his article “Is Google making us stupid?”) is that the Internet is changing our minds, our ability to think and the way we use our memories, and all this not necessarily for the better. Essentially, the Internet is a universe of distractions, offering endless light entertainments and pointless interruptions that train our brains into an addictive shallow pattern of ineffectual multitasking. We hold up the new technology on a pedestal as a doorway to a new world of knowledge and communication, bringing with it benefits for social interaction, personal liberty and scientific endeavour, but Carr claims that this portal is not without its drawbacks vitiating our ability to think deeply, or use our memories effectively. Whilst much of the furore that came after the publication of his article/this book ascribes him to being a drum-bashing technophobe, there is little Luddite rhetoric here, and this book is far from the grandiloquent jeremiad its often labelled as being. The book itself is largely well-written, with the core argument never far from the narrative, and there is plenty of research here to back up the claims. Certainly this is no serious scholarly work, the charge often levelled at Carr that he only cherry-picked research findings which bolstered his main argument is probably justified, but there is enough food here for thought. The arguments of the aforementioned article have been padded out with some interesting historical background, findings from the realms of neuroscience and psychology, and parallels to other technological shifts, but at times it does feel like one is reading an undergraduate essay hurried off to a deadline: a string of hopefully worthy quotes, strung together by the occasionally conjunction (“…” and “…”, however “…”). The best chapters are those which don’t shy away from using the personal pronoun ‘I’ and reflect the authors own observant struggles with the new age technologies, and the sadly all too short chapter on the Internet’s influence on our use of memory is of its own a very thought-provoking aside. At less than 250 sparsely-packed pages, this is a book that shouldn’t exhaust even the attention span of the novus homo it describes. It should be of interest to people born both sides of the Internet divide, and the well-researched reports on historical parallels and psychological aspects offer plenty of titbits for our minds to work on. The reproach that Carr offers no solutions to the problematic developments he highlights is, in my opinion, to the book’s strengths not weaknesses. It is a commentary, rather than a critique. Social change can be halted about as easily as the tides, though we might as individuals choose to tread our own paths. But it behoves us all well to acknowledge Change’s existence.